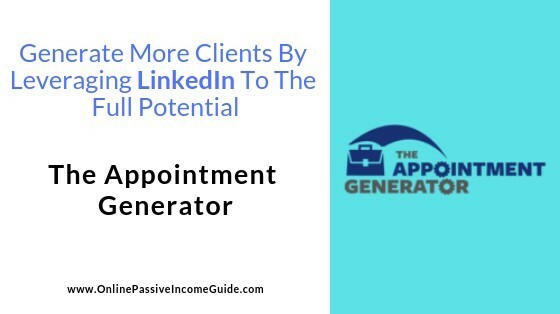 The Appointment Generator Review - Acquire New Clients Through LinkedIn? You are probably wondering if this program by Josh Turner can help you generate more prospects and clients through LinkedIn, or is it just a waste of time and money. Join me in The Appointment Generator Review in order to find out why should you join it or not. 40% of monthly active users use LinkedIn daily. And many other facts that show how huge the potential is for growing your business in case that utilize LinkedIn properly through the right guidance. And this is why The Appointment Generator was created by Josh Turner and LinkedSelling. The Appointment Generator is a training and coaching program that comes with an automation software which are supposed to help you generate a consistent flow of leads, sales appointments and clients faster and without spending money on expensive ads, looking salesy, or wasting long hours on your computer every single day. How Does The Appointment Generator Work? The Appointment Generator Includes an 8-week implementation bootcamp and live coaching sessions and workshops that are supposed to teach you how to use LinkedIn in order to generate more leads and find prospects and paying clients. It also includes a free trial to a sales automation email software that will help you in saving some time when contacting the prospects. The Foundation – Learn the 3 things you need to do first in order to maximize the number of appointments you’re landing. How to build your Authority Leadership Platform – This is the how you stand out from the competition in your field and open doors with qualified clients whom you probably would never be able to get appointments with before. Building Your Database – A set of systematic strategies that are proven to quickly build a large list of targeted prospects who will view you as a leader in your market, even without having a current list. Your Messaging Machine – You should learn here how to use 4 of LinkedSelling proven processes for converting prospects to appointments, including the exact scripts that you can use. The Email Blueprint – Learn how to get 10-20% increase in the number of appointments you can book using this system through the best way to combine email with LinkedIn and Facebook. Lifetime Access to The Appointment Generator. TAG 8-Week Implementation Bootcamp & Live Coaching Sessions. Earlybird Bonus #1: The Traffic Generator. Earlybird Bonus #2: The Sales Generator. Earlybird Bonus #3: The LinkedIn Ads Funnel Workshop. Earlybird Bonus #4: Sales Conversion Mastery Intensive Training. Earlybird Bonus #5: 1-on-1 Post Launch Strategy Call with one of our Client Strategists. Earlybird Bonus #6: Free Trial Access to a Sales Automation Email Software. Earlybird Bonus #7: Exclusive Access to our Top Performing Email Swipe File And Sales Automation Scripts. Earlybird Bonus #8: Access to our LinkedSelling Partner Program. (allows you to promote The Appointment Generator as an affiliate and make commissions if you bring new members). This is what you get if you join during the Live Webinar or the replay between February 11-14. Bonus #1: The LinkedIn Ads Funnel Workshop. Bonus #2: Sales Conversion Mastery Intensive Training. Bonus #3: 1-on-1 Post Launch Strategy Call with one of our Client Strategists. Bonus #4: Free Trial Access to a Sales Automation Email Software. Bonus #5: Exclusive Access to our Top Performing Email Swipe File And Sales Automation Scripts. Bonus #6: Access to our LinkedSelling Partner Program. (allows you to promote The Appointment Generator as an affiliate and make commissions if you bring new members). This is what you get if you join after the cart is open between February 15-20. Notice that the only difference between this package and the early bird package is that with the early bird package you get two more bonuses: The Traffic Generator and the Sales Generator. One of the few programs that focus on using LinkedIn for growing businesses, while most others focus on using Facebook. Works great in case your business is in the B2B field. It is about LinkedIn, which is the first and the largest professional network that gives you the chance to contact professionals in different fields with laser targeting possibility. LinkedIn is still an untapped platform when compared to Facebook for example, which gives a higher potential of getting your message delivered at a lower cost. People on LinkedIn are already in the business mood, which also makes it a bit easier to get prospects and clients when compared to Facebook where people login for fun. Includes a 1-on-1 call with a client strategist from the LinkedSelling team. Exclusive access to LinkedSelling’s top performing email swipe file & sales automation scripts. You get a commission if you refer others to join The Appointment Generator. There is a “We Won’t Let You Fail” 10 Appointments per Month Guarantee, which guarantees that you generate 10 or more appointments in the first 60 days, and at least 10 appointments every month after that. The price is a bit high in my opinion. However, the fact that there are not many programs that focus on LinkedIn, and the fact that there’s a great potential for growing your business and make money with LinkedIn make it reasonable. The Sales Automation Email Software is not free, however, they give you a free trial, not clear for how long. Who Is The Appointment Generator For? The Appointment Generator is for you if you have a product or service to sell to other business, especially if you sell high-ticket services or products, whether one-time or recurring. And of course, those who wish to join The Appointment Generator should be willing to put the time and effort applying what they learn consistently. Early Bird Offer (Best Option): 11-14 February. Click Here To Get It! Full One Payment of $1997. Three Payments of $747 each. Open Cart Offer: 15-20 February. Click Here To Get It! Six Payments of $387 each. As I mentioned earlier, there’s no refund policy. However, if you still are not sure if The Appointment Generator is for you or not, then you can at least watch the FREE webinar that will show you some useful insights even if you don’t want to signup for the core program of The Appointment Generator. Conclusion – Is The Appointment Generator A Scam Or Legit? The Appointment Generator is not a scam, it is a legit program that teaches you how to generate more leads and clients if you put what you learn and put into consistent action. What is great about it in my opinion is that it focuses mainly on utilizing LinkedIn as it is a professional network while most other training programs focus on Facebook where people are used to get more relaxed and waste their time. Remember that you need to have your own product pr service to sell to the prospects, otherwise, I don’t think that you will benefit from joining The Appointment Generator by LinkedSelling. However, if you don’t have your own business or you don’t have a service to sell to clients, then I don’t think that this will be the right investment for you even though The Appointment Generator is legit. Alternative To The Appointment Generator? 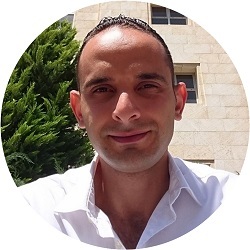 As I mentioned earlier, The Appointment Generator is a legit program that will teach you how to generate more leads and potential clients in case that you already have a business. But in case if you don’t have a business at all, and you are looking for a way to start an online business and don’t know what method to choose, then I can recommend for you the method I personally do in order to make money online. This method is a 100% legit method and many people are doing successfully. It is a bout building a real online brand and business that will make you money on the long run if you work on it consistently. No magical push-button, MLM or any kind of those scams. I have written a thorough guide on what this method is and how it works, and this guide will lead you to the same platform that can help you learn and build your business with the support of a great community of more than 1.5 million online entrepreneurs. And this method doesn’t require a big investment, the platform I recommend in my guide will provide you with both; the training and the main tools all in one package for no extra cost. And even better, you can try it for FREE before you pay anything. No Credit Card Required. 100% Risk FREE! Lurn Insider Review (By A Real Member) – Is It Worth The Money? The Appointment Generator is a promising way to build network on LinkedIn and also sell products to prospective buyers. However, after reading your review the idea is still foggy to me. I don’t fully understand how LinkedIn marketing is better than Facebook marketing except in the corporate world. It could be worth a gamble if you shed more light on the topic. Hello Louis and thank you for the comment! I agree, LinkedIn in this context is more dedicated towards helping businesses connect to other businesses and not to individuals. For example, if you can build websites, then you can contact small business owners who don’t have websites and offer them your services, and so on. But if you sell dropshipping courses, then I don’t think that LinkedIn is the right place to find your audience! It is more successful if you are in the B2B world, and that is what The Appointment Generator was created for. It looks like a good opportunity for people that could actually afford the platform as it is a bit pricey obviously, but reading through all the pros and cons of the platform, it’s not that bad apart from that. It’s okay the Refund policy is also an issue but you wouldn’t dive into something if you’re not all that clear what it is right? LinkedIn is very efficient for matching clients and workers together, it is very interesting to see a platform like The Appointment Generator tackling another angle in terms of building relationships between businesses. I agree that it is difficult to enrol into something that costs around $2,000 without a refund policy, but they have a “Results Guarantee” for getting results if the members took action on what they learn there. They wouldn’t be there for years now if they were not able to deliver something unique and really useful. I believe that for business owners, this is a reasonable risk-reward balanced opportunity, I think it’s worth the investment. The appointment generator is good but the price seems a bit high. Paying such an amount won’t be easy for a beginner in online business. Well, I think it is really for those who have made it big in the online world and those who already have a product to market, but since there are not many programs that focus on LinkedIn as a way to generate leads and clients, it might fine. I agree, it works better for those in the B2B space and not B2C. However, when it comes to the price, I have seen some training courses on the dropshipping for example that are being sold at a higher price, and those are being sold to those who are starting out. This is really a great review about Appointment generator, where to get it and how to use it. Thanks for the information! It’s unfortunate that it is mainly for businesses and not individuals, I wonder if I can use LinkedIn for marketing affiliate products. Hello Ayodegi and thank you for your comment! It’s true, The Appointment Generator from LinkedSelling focuses mainly on those who have a product or service to sell. But still, LinkedIn can be used for affiliate marketing if you match the right audience with the right product that you want to promote.